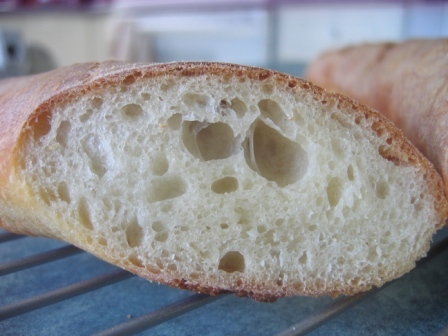 Love the crumb on those baguettes and many thanks for the thorough write-up and recipe. I was pleased with the crumb myself. 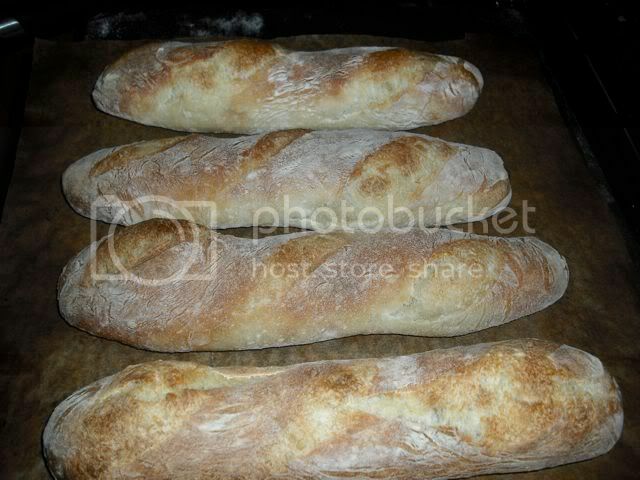 I've struggled with baguettes using several different recipes. I think the improvements I've seen have been mostly due to my starting to get the feel of the "iron hand in a velvet glove" when handling the dough. I must emphasize "starting." I'm glad you found the write-up useful. You've made some pretty nice baguettes yourself, as I recall. This is a recipe worth trying, I think. I know what you mean about dough handling especially with baguettes. I'm a long way off getting a consistent baguette. My main problem at the moment is in the oven. Baking on a circular pizza stone does not lend itself well to long thin baguettes and pretty much rules out any covered steaming (no tight seal unless I'm using an upside down bowl and baking a boule-shaped bread) Would definitely like to give this recipe a try though. David-I just mixed this dough up along with a small pinch of rye flour. I'm in the middle of my folds now. After shaping, how long did you let rise? Did you let it come to room temp before or after shaping? See the procedures in the original post. Divide right out of refrigerator and pre-shape. Rest for one hour. I can't get the pictures to attach right now with my iPad but the bread was amazing! Best French bread I've ever tasted, really! I will never buy Safeway bread again! I used 1 cup high protein flour, the balance KA flour and we loved the chewy crumb, crispy crust. We've eaten all but one of the four mini baguettes since yesterday morning, just the two of us. I warmed a frozen one for lunch today, 20 minutes at 200 degrees. Thanks, all! I happy you like the Bouabsa baguettes, Doc Tracy! P.S. I hope you get your photos up. I am desperately trying to find the time with NO success to do a write up about some sourdough + yeast baguettes using Anis's techniques. The flavour is wonderful!!!! Since you said the flavour wasn't that great with these ones, maybe you are just a die hard sourdough lover like myself. The sourdough added the flavour and the yeast, the lightness (though not as light as a full yeast baguette, but who cares). They were wonderful the next day toasted and it's rare that I like baugettes the next day. Your baguettes do look lovely. I realized that the incisions do have to be deep to really get nice oven bloom (at least in my oven). And the stone has to be very well heated. They also need longer baking than I would have imagined. Anis made his apprentice put some back on the oven even though I thought they looked great. Then when I made them, I realized quickly that they LOOK finished but aren't! I'm sure you'd love the flavour better with real T65 organic flour. I'd love to hear how you convert Anis' baguettes to soudough. I do confess to being "a die hard sourdough lover." 1. 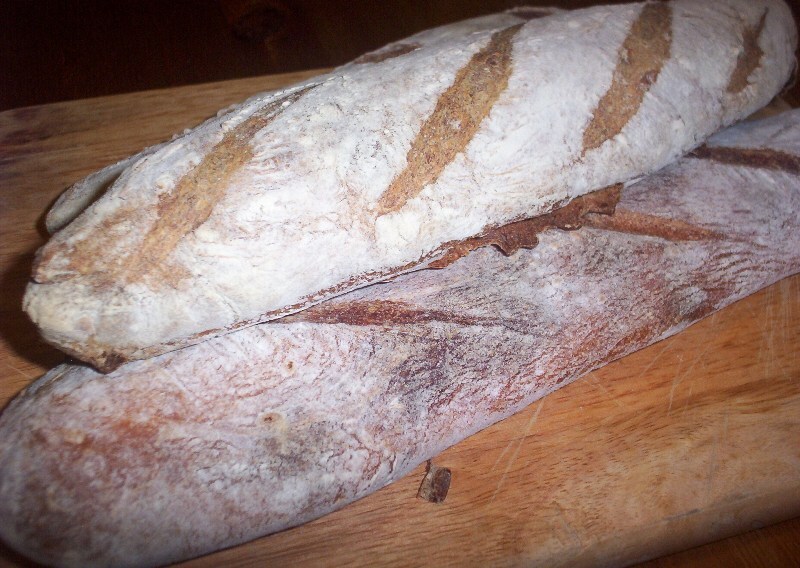 The lame blade should be held at a 45 degree angle to the surface of the loaf. 2. The depth of the cuts does not have to be super deep. 1/4 - 1/2 inch. 3. The cuts should not be too long. About 5-7 cm seems right. 4. The cuts should angle only slightly from the long axis of the loaf. 5. The cuts should overlap about 1/4 of their length. 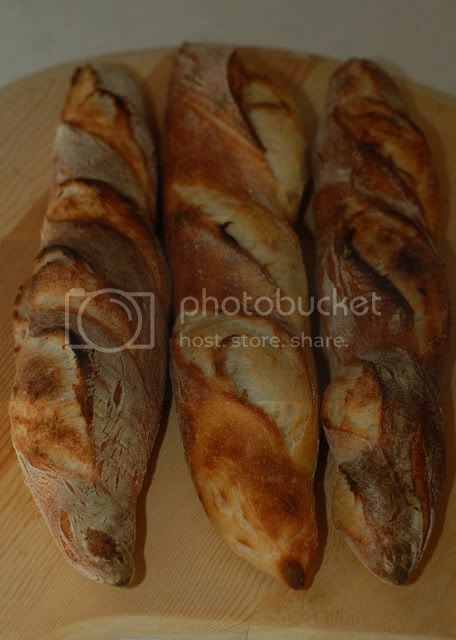 None of the pictured baguettes had perfect scoring, in my opinion. The middle one looks best to me, except for rule #1. I held the lame too close to 90 degrees. The loaf on the right was better, except it violated rule #4. I downloaded most of the videos of Prof. Calvel's lessons from the CIA (Culinary Institute of America.) I watched him scoring baguettes over and over. He uses a French lame with a curved blade. His strokes are very fast and firm. He holds the lame with the concavity toward him. With each stroke, he does a little wrist turn which lifts the cut flap up from the surface of the loaf a bit, I think. I suspect that's the way to get an ear and good grigne. That's the next refinement of technique I want to shoot for. BTW, the order page lists the price per segment as $4.95, but the price in the "shopping cart" was only $3.95. I just downloaded four of the videos offered. They are great. From where I'm sitting it looks like you've "nailed it"...Big Time. You should feel very good. You managed to figure it out via reverse engineering. Thanks for keeping at it and expecially for sharing your techniques and recipe. They're beautiful. Your baguettes look beautiful inside and out. Sorry you're not overly excited about the flavor, I wonder if Jane's SD recipe might please you more. They are gorgeous though and I'm sure would please most anyone who tried them. Thanks for the post. About the chicken cacciatore...I always make mine the day before we eat it because it's best that way, same as osso bucco. Is that what you do too? Did you ever sizzle up some pancetta to start your cacciatore? Yum. Did you mix the broad beans with the fedelini or were they two separate side dishes? The whole meal sounds sooo good. Your baguettes must have been perfect with this dinner. The chicken cacciatore recipe I use is from "The Artisan" website. It's wonderful. I agree about most braised dishes tasting better the next day. The broad beans were not shelled. They were very young and fresh from a farmers' market. The fedelini was wonderful with the cacciatore sauce. I don't know Rancho Gordo, but I'll check it out. Thanks! My wife is a serious bean lover. I'm still working on my "mental mis en place." It sort of flickers still. Loose connection somewhere. When slashing - your elbow does not flex. It stays in position. This has helped me. I made a batch today (first time). Let me restate that. I made a batch based on the same measurements minus the commercial yeast. I see in your description you state it has a, "chewy mouth" and crust a little thicker than your traditional version. Mine has a that chewy texture and I used all purpose instead of bread flour. I am wondering if the bread flour in the preferment changed the crumb. I used 215 grams of preferment (made 20 hours earlier and with bread flour). 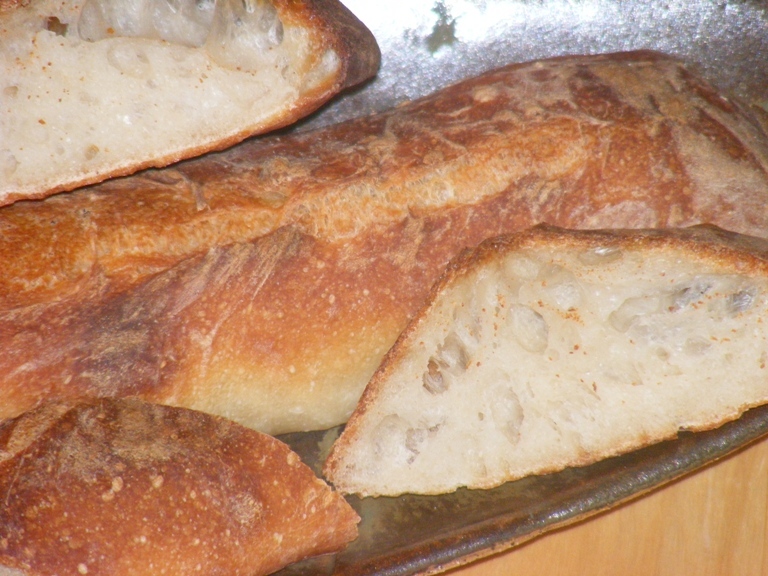 They have a great taste and the crust is a little thicker than a store baguette. I had some issues with getting them into the oven (well, many issues). The crust kind of shatters like a thin hard candy when you bite, which I really like. Anyway, you, Eric, Mark? Any thoughts? Is your question "does using bread flour in sourdough starter yield a different crumb in the bread than using AP flour in the starter?" If your starter was 215 gms (which means 100 gms or so of flour, actually) and you added it to 500 gms of flour, I'd say the difference between AP and Bread flour in the starter would be negligible. First of all, thank you for providing the cup measure for the recipe. I have not gotten my scale so the volume measure is really helpful. I tried to follow the recipe as much as I can. However I am very eager to put my new wild starter (it was ready to use four days ago. thank you jane for all the help.) to use that I replaced the instant yeast in the recipe with 1/4 cup of my pet. I also added 1/3 cup more water. I am new to sourdough so I am not used to all the shaping, scoring, etc. Here's the result of my first attempt. I have not gone through the shaping and scoring tutorials...I will eventually. I did not use a baking stone. Is baking stone critical to helping the bread rise? My bread did not seem to rise like in most of the pictures on this site. I know there's a lot of other variables that contribute to this, any pointers would be appreciated. I loved the taste of the bread. Hopefully, attempt #2 will be better. Thanks again. So, your baguettes are all sourdough? I'd say your baguettes are outstanding, especially considering it's your first trial of a new recipe and you are new to sourdough! 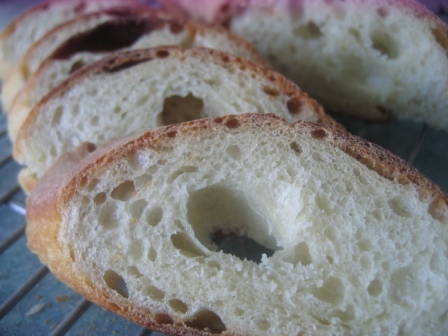 The crumb looks excellent - nice holes. I must have made 2 dozen or more baguettes before I started getting a crumb like that. The scoring will come with attention to method and practice, practice, practice. Most feel that a baker's stone helps keep the oven temperature more constant and helps with oven spring. However, there are also contrary opinions. I'm in the majority, personally, but there are certainly good bakers who do without stones. Looking forward to seeing more of your breads. I have a pizza stone but it's too small for bread such as these. I must look into getting a baker's stone. 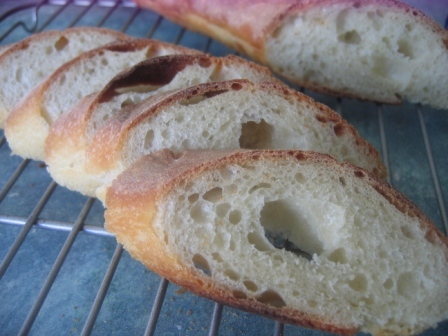 I set up a Group Bake on Facebook for this week, using Greenstein's French Baguette recipe. It's a fairly straightforward recipe, and since a lot of the bakers in the group are novices, I thought we'd start with something simple. That said, for my own baguettes, I decided to try Anis Bouabsa's recipe, as I've wanted to try it since I read about it here. I was surprised at how slack this dough was. I knew it would be, from what I've read about it, but handling it was still a shock. I followed the instructions and David's hints. and was really pleased with the results. 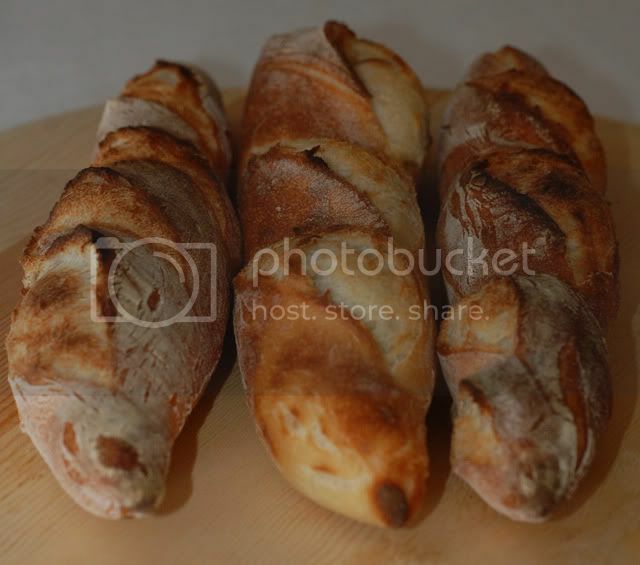 I am going to make the Greenstein baguettes with some friends tomorrow (sort of a mini baking class at my house -- and I'm being compensated with really good wine!). But I think the Anis baguettes may be the new standard. 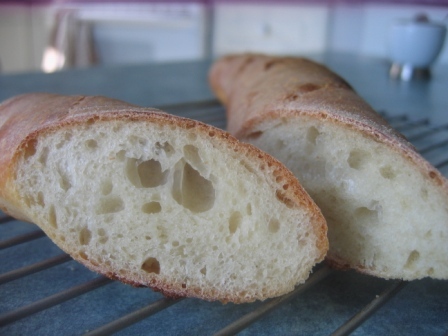 Since you seem to enjoy experimenting, you might want to also try Gosselin's baguette formula. Like Bouabsa's, it is a slack dough compared to traditional 65-66% hydration baguettes and it also involves an overnight cold fermentation. The Gosselin formula was what Reinhart modified to develop his pain a l'ancienne in BBA. If you want to try it, LMK. There are a few tricks I've learned wrestling with this formula. Personally, it has produced the best-tasting baguettes I've made. Thanks for posting your version. I'm going to try it tonight! I love your loaves- beautiful! Let us know how they turn out. How I envy all of you, eh !!!!!!!! Thanks for posting. I've made notes and must get this underway in the near future. The oil measurement becomes simpler if you remember that there are 16 tablespoons in a cup. 3/4 of 1/4 cup is 3/16 cups, so 3 tablespoons! 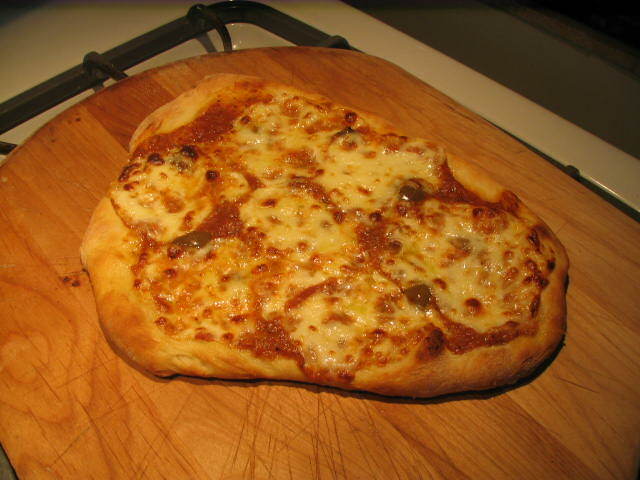 Photo of pizza....the crust is very crispy and light......I really appreciate this Anis Boubasa recipe. My baguettes come out very well using his recipe. I would like to thank you for this very inspiring post. This baguette was the best I've tasted so far in this pasrt of the globe. And the great news about it was how easy and straightforward the steps were. I need to practice the scoring for an appealing look, nevertheless the crust was delicious. I made this recipe last week and I must say I didn't get the flavor that everyone is talking about. It was probably the blandest bread I've made so far (I'm wondering now if I had somehow forgotten to add the salt). The dough was also so slack that it turned into a ciabatta shape. I did get the crumb (holes and sheen). I'll give it a second go. This recipe was so amazingly easy! The mixing, chucking it in the fridge, the pre-forming, it's all so simple. The only slightly complicated thing is factoring out what time you actually want to bake them. I used King Arthur Bread Flour, instant yeast, kosher salt and filtered well water. I am definitely making these again. I think I'll try it for pizza dough tomorrow night. I've made bread using Bouabsa's formula with sourdough starter added - still using the yeast - and with sourdough starter as the only leavening. All are good. You just need to plan on a longer bulk fermentation if you omit the yeast. If you try it, let us see your results. 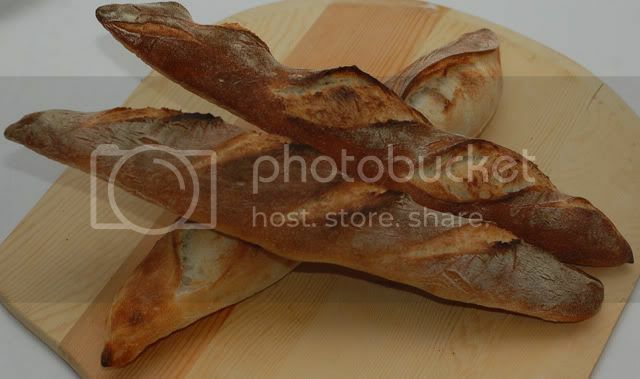 Your baguettes look wonderful! Nice scoring and wonderful crumb. I'm glad you enjoyed them. Thanks for posting your bake. Bouabsa's method was a watershed for my own bread baking. After making several batches according to his formula, I started riffing and ended up with my San Joaquin Sourdough, which is the bread I make most often. If you like the baguettes, I'd encourage you to try them with 10% whole rye and a sourdough levain (20% baker's percentage), with or without the added instant yeast. Maybe you have made the SJ SD. I can't recall. If not, I think you would like it. 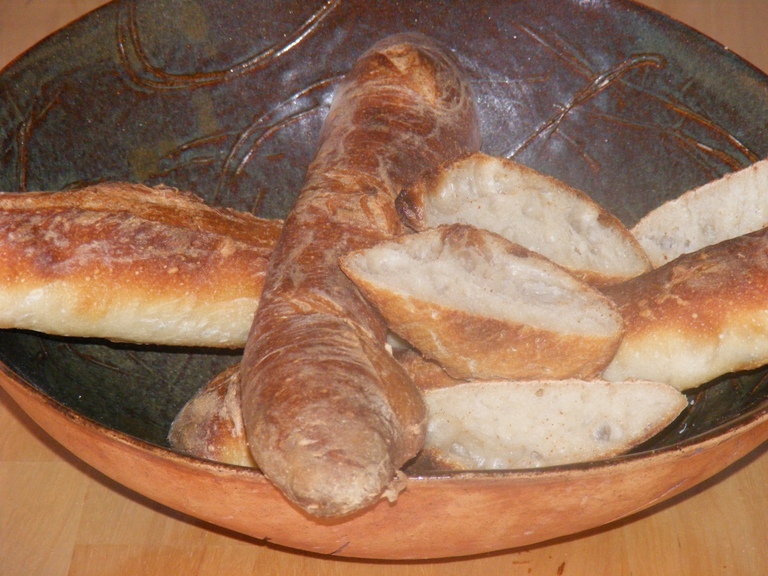 I usually make it as bâtards, but it is good as baguettes or boules too. Thank you David. I will definitely try the SJSD. I just bookmarked it and will work on that tomorrow. The Bouabsa method is amazing. Even though the dough initially was very sticky, it worked out beautifully. My son made a standard baguette with starter today so we had something to compare to the Bouabsa baguettes. Best regards and happy baking to you too! Very nice baguettes. Gorgeous crumb! Wow, they exploded! They look fantastic. David thank you for all the information you share on this bread site. Yours and others sharing makes this a friendly site to visit. Again thank you. I am just wondering again about product language in different countries and I feel I need your help or any one else who may have an answer. You mention that you use "instant yeast". Here in Australia I use an "instant dried yeast". Are these the same styles of yeast being used under different names in another country or are they totally different yeast performing the same job? I hope my question makes sense!!!!............Pete. I would guess it's the same thing. There are three types of yeast routinely used in the USA: Fresh yeast, Active Dry yeast, and Instant Yeast (or Instant Dry Yeast). They are interchangeable, but to produce equivalent results, i.e. proofing times, one needs to use differing amounts when substituting one for another called for in a formula. Additionally, Instant yeast can be added to directly to the dry ingredients, Fresh yeast and Active Dry yeast require hydrating in warm water, and proofing. Here's a link to a tutorial that gives more details. http://whatscookingamerica.net/Bread/yeastbreadtip.htm. I'd make a small wager, your Instant Dried Yeast is the same as USA Instant Yeast. I tried this recipe tonight with some moderate results. I used the remainder of some RobinHood "best for bread" flour which I understand is bleached. I did not get very much rise in the fridge at all, and very little (if any) when it came out. I did get a decent oven spring. Even with steam the crust is more chewy than anything. Was this due to te quality of the flour? Did the bleaching ingrediant stuffle the small amount of yeast? The bread tastes fine, just a very closed crumb with a couple of bigger holes and no real crust. I find that i have my best results when using plain AP. My local market has its house brand unbleached AP for less then 2 dollars a bag. Higher gluten flours do not seem to work as well for me. Also, try not to over develop the dough before putting it in the fridge. I remove mine from the fridge and divide, then let it rest for an hour before shaping. I then let them proof until they are puffy, About doubled. (takes as long as it takes) Then into a ripping hot oven with lots of steam. Dang-it, got my mouth watering I haven't baked these in a month and now I want some. Is there any ill effects if you leave it in the fridge for 24 hours? Is there a particular reason why it needs to be 21 hours? 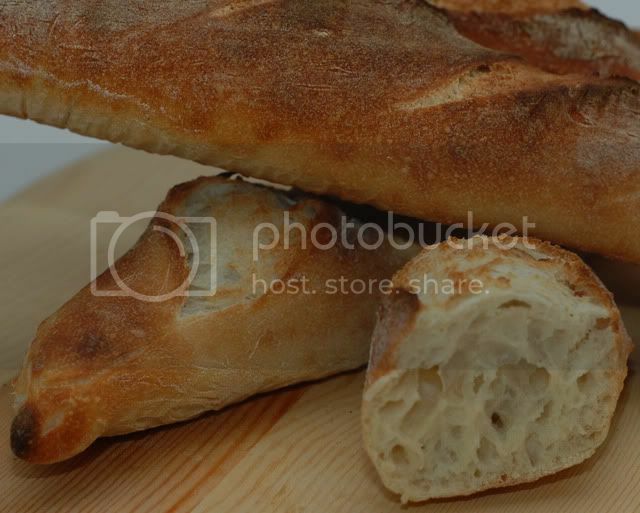 Also, when you're shaping the baguettes, should you minimize flouring or use oil on the worksurface? I've read a bunch of posts on this subject, but it'll be my first time making a real baguette shape. Thanks. The 21 hours comes directly from Anis Bouabsa. That's how long he retards the dough. However, use a time that works for you. I have retarded as little as 16 hours and as much as 36 hours. The bread will be tastier if you retard no less than this. At the longer end, the bread becomes more sour. I shape baguettes on a lightly floured board.